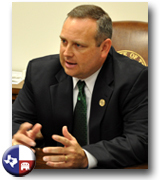 Rodney Anderson is the State Representative for the 106th House District of Texas. Born and raised in Grand Prairie, Rodney Anderson has always worked hard, not only to take care of his family, but also to give back to his community. He attended Bowie Elementary School, Lee Middle School and Grand Prairie High School, all within the GPISD. He is committed to public education and serving others, and he has volunteered countless hours to various organizations including the Boy Scouts of America, PTA, the YMCA, and Rotary International. Rodney has seen and experienced the dramatic changes in House District 106 in his lifetime. It is important to him that everyone in the district be represented fairly. Rodney is dedicated to serving the people of Irving and Grand Prairie and is not a career politician. He is a businessman who believes that strong, solid business principles are needed in Austin and Washington. He is committed to using his business experiences over the last 29 years to cut excessive spending, keep a strong pro-business environment that fosters job growth, and assist teachers and schools to keep resources at a local level. This is his commitment to the voters of this district. At the age of 12, Rodney entered the job force: he had a paper route until he was old enough drive. Then he began his own landscaping business. When he enrolled at the University of Texas at Arlington, he waited tables to earn money in between his studies. He learned early in life that small businesses create jobs. He learned that in order to succeed, he had to keep costs low, work incredibly hard, and serve others to truly be considered a success. While in college, Rodney had the opportunity to work for what is now Bank of America where he was an analyst. Upon graduating college with a BBA in Real Estate, he became an asset manager with the bank at the age of 22 handling more than thirty properties valued in excess of $60 million. He was recruited away from the bank by Chicago Title Company, which at the time was the largest title insurer in the country. After a successful eleven year career, Rodney became a minority owner of a title agency in Denton County where he was President of the company. Rodney later joined Commerce Title Company where today he is a Vice President. His commitment to the district is surpassed only by his commitment to his wife and family. He married Heather Jerden in 1991 and they have three children who are currently enrolled in the Grand Prairie School District. His grandfather, Bob Harless, moved his family to Grand Prairie in the early 1950’s. He was a house painter and small business owner in Grand Prairie for more than 40 years. Rodney’s father and mother, Bennie and Sandy Anderson, have owned a small property management company in Grand Prairie since 1986 and prior to the real estate business, his father worked for many years at a local defense contractor. His father in law was a school principal in the GPISD for more than 35 years, and his sister in law is a teacher with over 20 years in the GPISD. These deep roots are what hold Rodney and his family firmly in Grand Prairie, and it is why he cares so deeply about the future of the area. This area is his home. It is his life. Raising a family in Grand Prairie where their roots are is important to both he and Heather, and he will work tirelessly to improve the quality of life for the people of Irving and Grand Prairie.